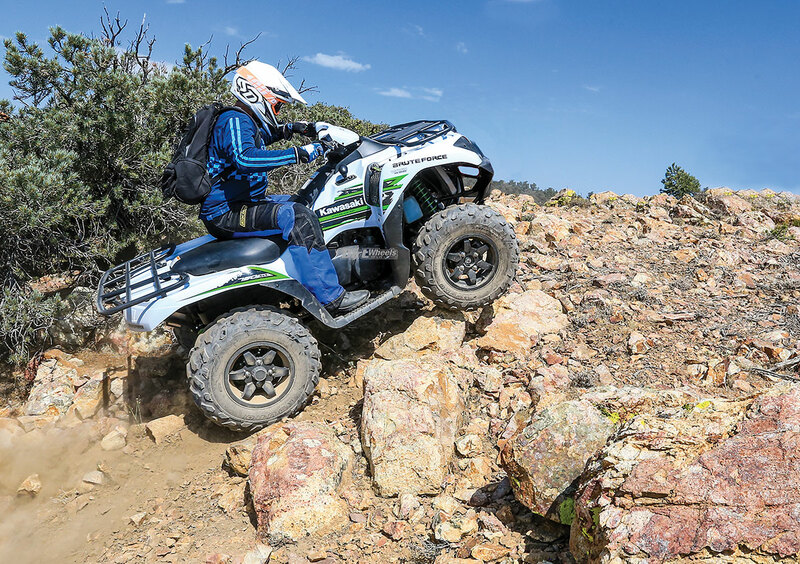 The Polaris Sportsman 570 SP and Kawasaki Brute Force 750 4x4i EPS both had electric power steering in this shootout, and they were more favorable to ride. 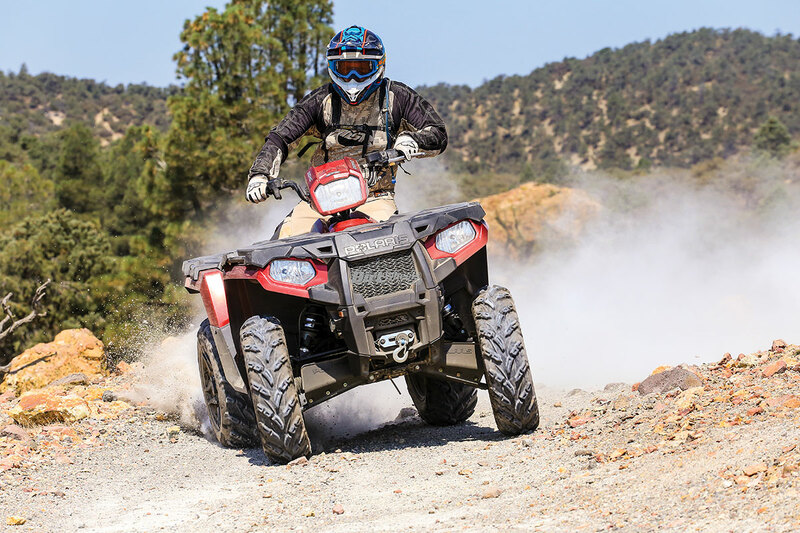 As time rolls on, technology advances, but the realities of the off-road market mean that the best-selling machines get the tech and marketing dollars. That means that big 4×4 quads keep improving, but they don’t get the attention UTVs do as they get more popular. Reductions in marketing dollars means it has gotten difficult to get enough of these big-bore brutes to perform shootouts. 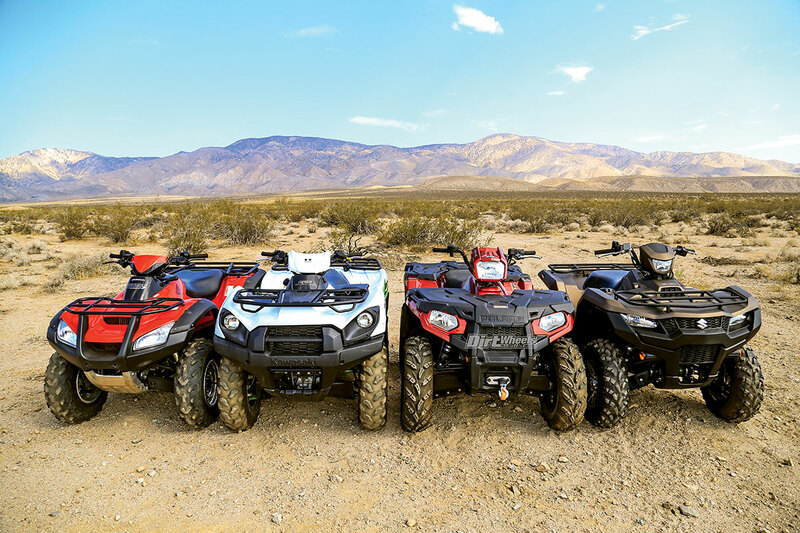 We managed to gather the Honda Rincon 680, Kawasaki Brute Force 750 4x4i, a small-bore (in this company) Polaris Sportsman 570, and last, Suzuki’s fully revised 2019 KingQuad 750AXi. A few competitive models are missing from this shootout, but we simply couldn’t get them all in time. These contenders are all great in their own ways, so let’s get to the facts! Only the Suzuki KingQuad 750 and Kawasaki Brute Force have a front-locking differential out of the group. All four of the engines in the shootout are different, though all are liquid-cooled and electronically fuel-injected. The unique 675cc Honda single utilizes a cam beside the head with push-rods operating the valves. Kawasaki gains its brute torque from the only 749cc V-twin cylinder in the test. Our Sportsman is a 567cc single that has a dual-overhead-cam design. Suzuki’s all-new KingQuad reps a DOHC, 749cc, single-cylinder engine. Three of our contenders pair their engines to automatic continuously variable transmissions, which use a primary and secondary clutch to loosen and tighten a belt to transfer power to the wheels. Honda is the only one in this lineup that has a fully automatic, three-speed, automotive-type transmission that can be switched to manual electronic shifting mode. 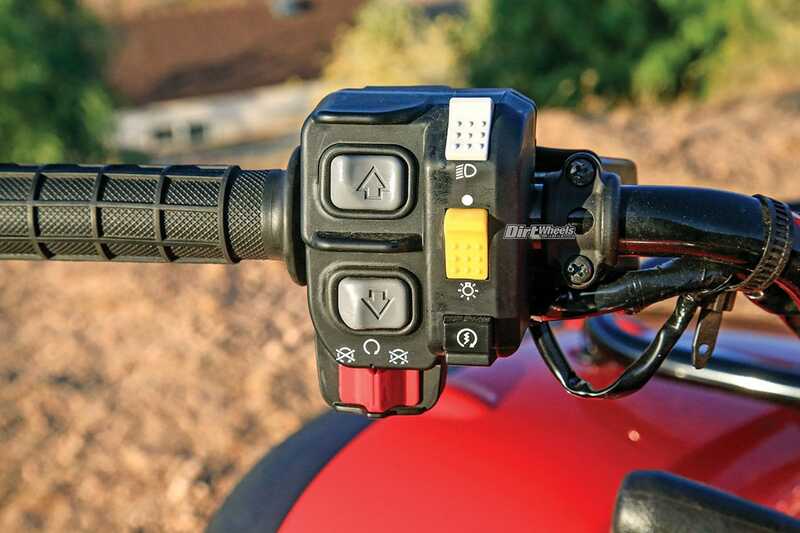 There is a push-button module on the left handlebar that you use to upshift and downshift the machine. Honda’s Rincon is the least equipped of the shootout. It does not come with a hitch receiver like the rest of the machines. The shocks are the least adjustable too. The Suzuki and Kawasaki have a high and low forward gear, neutral and reverse gears. The Polaris has the same gears but has a park gear included. All four quads have manual parking brakes as well. The Honda has a second shifting lever below the left handlebar that switches the big red between forward, neutral and reverse. All the machines turn the wheels through shaft drive from their transmissions. The common theme with these quads is their 4×4 or all-wheel-drive capabilities. Each system is a bit different. The Honda Rincon has a capable system, but is doesn’t come with a front-locking differential, and you can’t order the machine with one. Kawasaki still utilizes the same trigger-pull-type front-locking diff that they have had for years. There is a lever that you pull in with your index finger that engages the front diff-lock. Polaris is similar to the Honda in the fact that there is no front diff-lock; however, Polaris’ On-Demand AWD system will lock the front diff automatically when it senses there is a need for it. Suzuki’s KingQuad is the only model in this shootout that has a fully locking front diff. 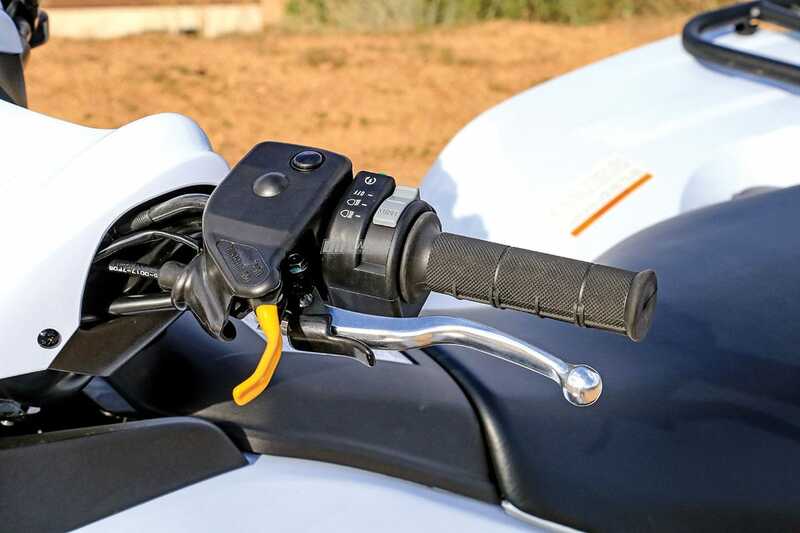 There is a switch block on the right handlebar that can be switched from 2×4, 4×4 and to 4×4 with the front diff locked. 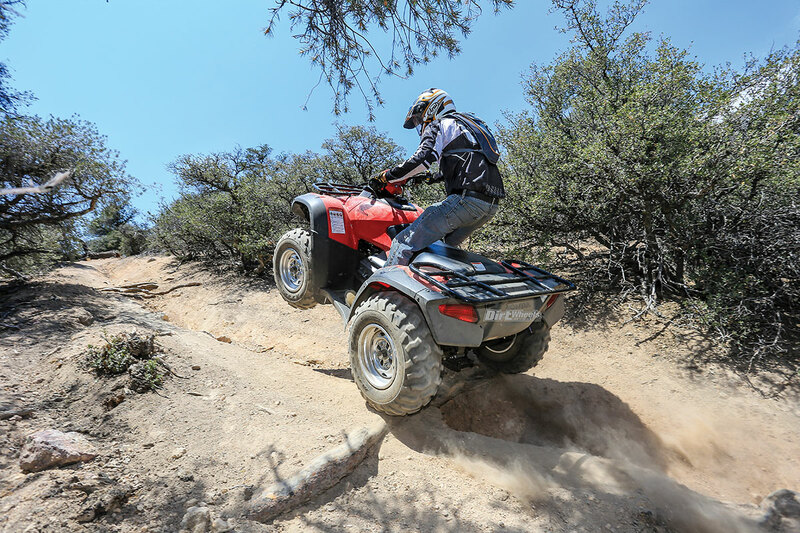 Over the years ATV manufacturers have become comfortable with sticking with the same platform for a long time. Honda’s Rincon and Kawasaki’s Brute Force have made minimal changes over the years, and that includes the suspension. Polaris has fine-tuned their quad over time, and Suzuki just revamped the KingQuad 750 with new styling, engine mods, an updated frame, better shocks and more. Kawasaki’s Brute Force has a trigger-style pull lever for the front-locking differential. It causes you to have a little less grip on the handlebar while utilizing it. It only engages when you have the lever pulled in. All four machines use dual-A-arm suspension front and rear. The trusty Rincon has the roughest ride of the group, yet has travel numbers comparable to the Kawasaki and Suzuki. Up front it rides on 6.9 inches of travel and has 8 inches of rear-wheel travel. The Brute Force has a supple ride with 6.7 inches of travel up front and 7.5 inches in the rear. Suzuki stepped up their game and provided the quad with a smoother ride than the old model due to new gas-charged coil-over shocks. The numbers are 6.7 and 7.7 inches of travel. The big surprise in suspension comes on the Polaris. The travel numbers and plush ride outperform its three Japanese counterparts in this shootout. Up front it has 8.2 inches of wheel travel, while the rear comes in at a healthy 9.5 inches of travel. It also has the largest diameter tires and the only 14-inch wheels in the test. This brings us to steering feel. In this shootout the Polaris and the Kawasaki are the only machines that have electronic power steering. The Suzuki does have available EPS, but after some unforeseen issues with our EPS model, we stuck with a base version that does not have it. Honda’s Rincon, while it isn’t difficult to turn, doesn’t even have a version with it available. The Brute Force is nimble and has the narrowest track width in the group. The EPS keeps the machine from being too busy in front. The Rincon could do well with power steering. The machine has a quick feel in tight terrain but loses a sense of stability at higher speeds. The Honda Rincon is the only transmission with sequential gears. The three-speed trans can be electronically shifted or put into automatic mode. Suzuki’s older models were infamous for having a steering feel that was far too twitchy. The 2019 model is better, but higher speeds are a bit daunting on this quad. 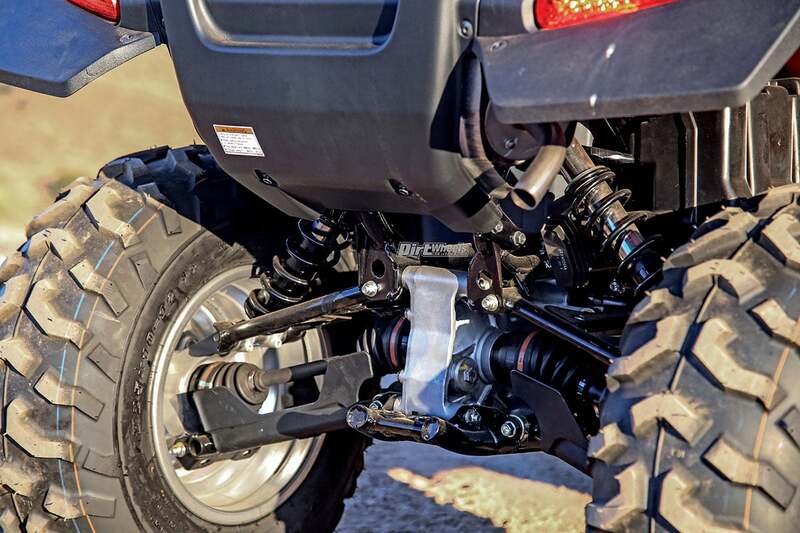 Like the Brute Force, the suspension is aimed at comfort, but it leans on cambers. It does cut through tight trails with ease. Polaris is the most stable in the bunch. 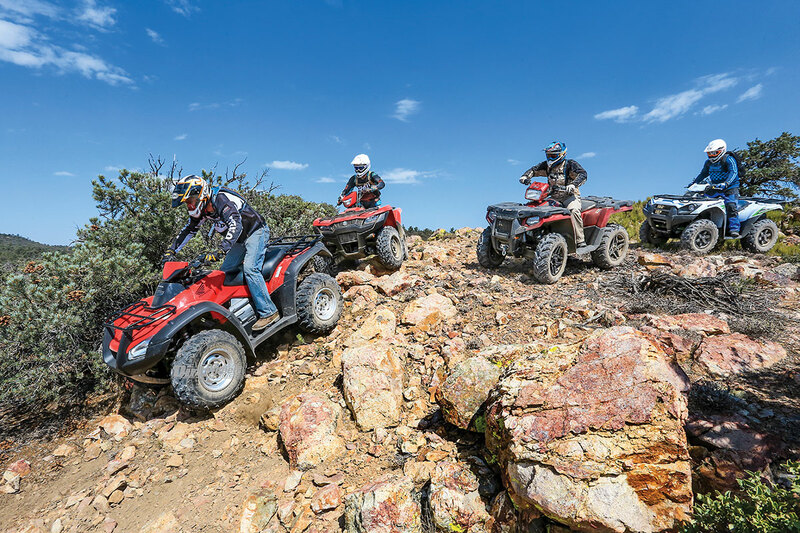 It is almost like Polaris develops 4×4 quads with an equal emphasis on sporting and utility use. At high speeds the machine feels sporty, and it corners very predictably. Its only downside is that in some tighter cornering the front wheels push a bit. The braking systems of these machines are all hydraulic discs up front. 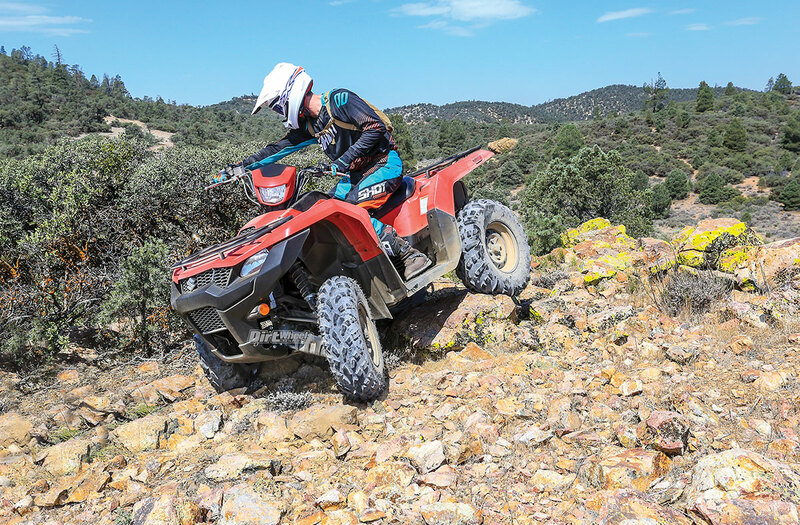 The Kawasaki and Suzuki utilize a sealed, oil-bathed, multi-disc rear brake, while the Honda has a single rear hydraulic disc, and the Polaris has dual hydraulic discs. The three Japanese ATVs have separate front and rear brake levers on their handlebars with a foot pedal that also controls the rear brake. The Polaris is the different one with a single left-side handlebar lever that controls the front and rear brakes, and a foot pedal that actuates the rear brake alone. The Rincon has the strongest braking capability in the group, but the levers are quite stiff and lack feel. The Suzuki and Kawi have a very similar feel to each other. Their rear brakes are not powerful, but are plenty strong enough to do the job. Polaris’ braking system is different but works quite well. It is strong, and while it is nice to have separate front and rear brakes, the single-lever pull does the job with ease. We do wish the fronts were a little bit stronger, and the rear tires start sliding under hard braking while the fronts still have traction. Suzuki redesigned their entire KingQuad 750, including the display. You can view many different operations on it. Rider accommodations are very important to our opinions of ATVs. Each of these machines feel unique, and not one of them has all of the best attributes in one package. Honda’s Rincon has the slimmest feeling between the rider’s legs. The seat height feels low. The handlebar bend is low for standing, and the controls seem dated. Kawasaki’s Brute Force 750 4x4i follows its namesake. The tank and engine shrouds are the biggest feeling between your legs. The seat is the most comfortable of the bunch, though, and the handlebar and controls are quite comfortable. 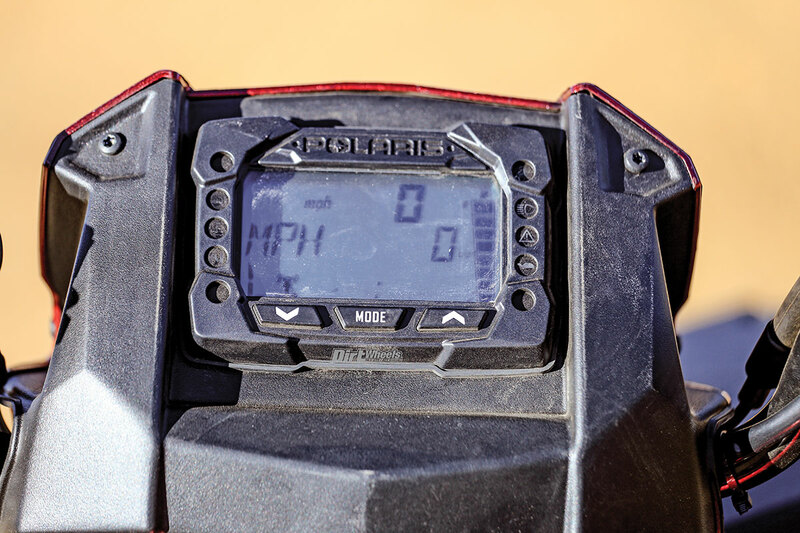 Polaris wins this bout when it comes to handlebar comfort and a sense of control. The bar bend feels just right for sportier riding but does not lack while seated. The minimalistic setup of the hand controls means there is less to focus on so you can keep your mind ready for the trails ahead. The seat is plush, but the sides scrimp on padding for your knees to grip while standing. The tank area is thin between the knees, but it widens out near the floorboards. 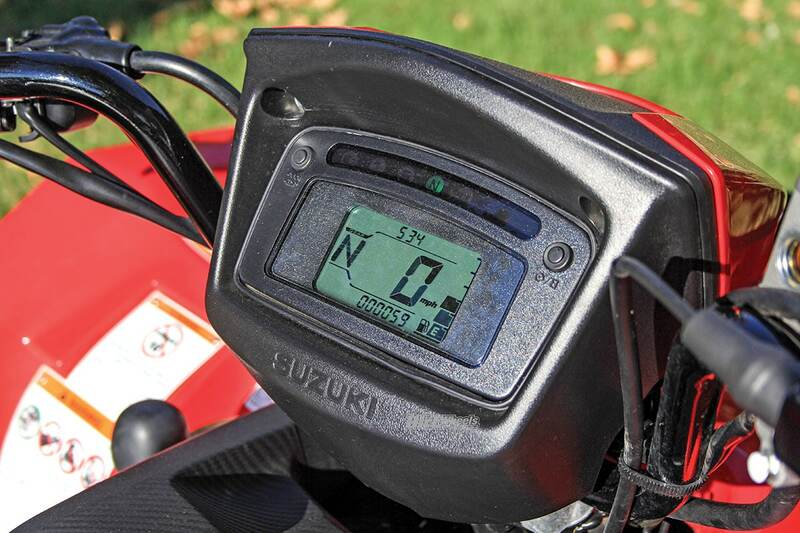 Polaris’ display is very visible at night and easy to read during the day. There are many different functions available through it. And last, the Suzuki KingQuad 750AXi is the most rounded-out machine when it comes to the feel between the legs, seat comfort and room. The machine falls short in the handlebar feel, though. The bar sweep is back and downward, which can be comfortable while cruising but hinders a sporty standing position. You also don’t have a strong sense of control at times with the setup. The KQ does have a great running board and peg setup, with Honda and Kawasaki falling in line behind it. Polaris could use a better footpeg and floorboard design. The Honda Rincon is the least favorable in the power department, but it is the only machine in the group that has a fully mechanical transmission. These are recreational utility machines, so we expect them to have a certain level of amenities. All four machines have cargo racks, but Polaris is the only one with plastic ones. On the opposite side of that coin, the Sportsman does have the highest cargo weight rating and it can tow the most. The Honda can’t tow at all, while the Suzuki and Kawasaki can tow over 1200 pounds. In the storage department, it is Polaris that is once again the most generous. Under the front rack, there is a very large compartment with another big bin in the rear of the machine. Suzuki has three different storage options with a watertight compartment. The Brute Force has a small bin in the center of the front rack and two more on the top front fenders. The Rincon disappoints with its lack of storage capabilities. 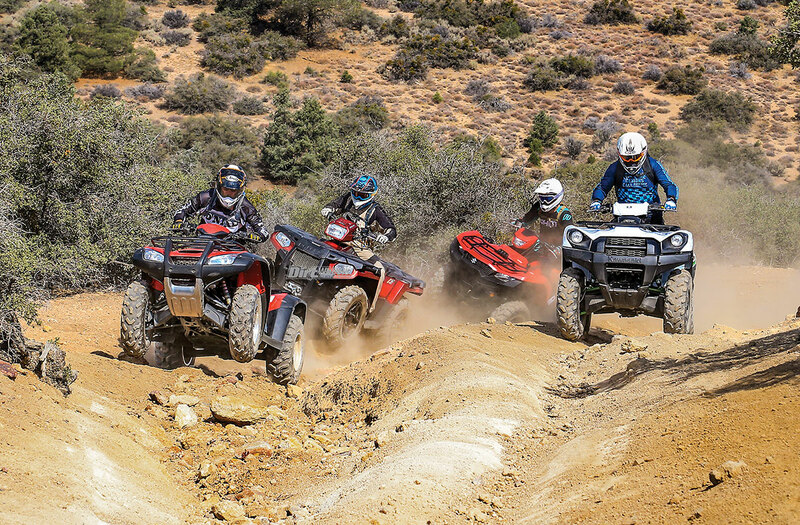 The Polaris Sportsman was the smoothest and easiest to ride fast and hard in the trails. It felt the most in control at all times, but in slow-speed sharp turns it pushes. The Sportsman also has the most front and rear suspension travel of the group and is the most stable. Picking a winner is never an easy task. All four of these machines have attributes that are better or worse than their counterparts. Some of our testers have different riding styles than the others, and that creates differing opinions. What we can tell you is how these beasts ride. The Honda Rincon was the most nimble-feeling machine in the group. It didn’t fare too well at higher speeds, but it shined in tight terrain. Its lack of EPS made it difficult to hold onto at a sporty pace, and a test rider or two almost got the bar knocked out of their hands in fast rough. As for the power, it is tame. It actually has a softer feel than the Polaris Sportsman 570. However, it is the only automatic transmission that allows you to shift gears, which adds to the fun of riding it. Unfortunately, with a major lack of storage, a rougher ride, no towing capability, no locking front differential and a lack of EPS availability, this quad has finally fallen short of its competition. Honda has some impressive 4×4 ATVs, but the Rincon is in need of updates. 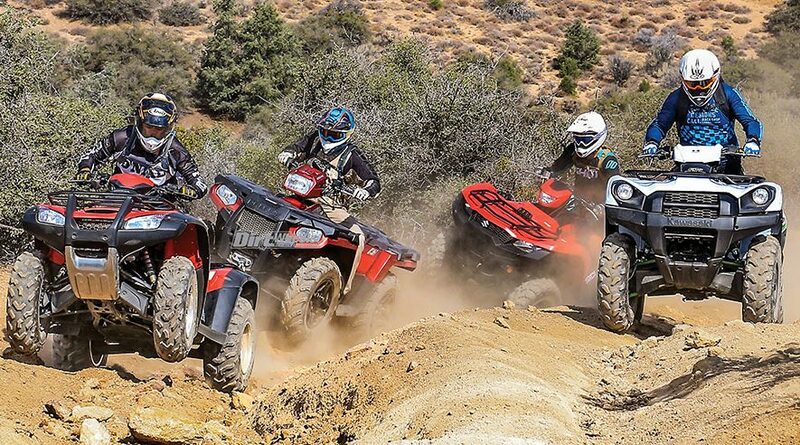 The Brute Force has the most torque and power through its V-twin engine in this shootout. It has the biggest displacement at 749cc. Kawasaki is next in line for some updating,; however, the machine still works well. The V-twin engine is the strongest by far and has the best torque feel of the bunch. It required superior throttle control in technical riding, and having to hold the diff-lock lever means less grip on the bar. The cockpit is wide but roomy and comfortable. It can tow, has a front-locking differential in the 4×4 system, and there is ample storage. It has the most chassis lean on cambers. We would love to see it gain a facelift with smooth off-idle response, new styling, sportier suspension and slimmer attributes. The Suzuki’s fully locking front differential makes it a great choice for crawling through rocks and in mud. Suzuki’s all-new KingQuad is new and refined, but not all of the machine is improved. The KQ’s downfall still comes in the steering. It is improved but still doesn’t feel planted and stable at higher speeds. However, if that was fixed, and given a new handlebar bend, this quad could take the gold in the competition. It’s got a very comfortable cockpit. The suspension is supple and works very well, as does its braking power. The engine is smooth but does feel a bit tame for its displacement. All in all, we would have to say this machine is able competition for the Brute Force. 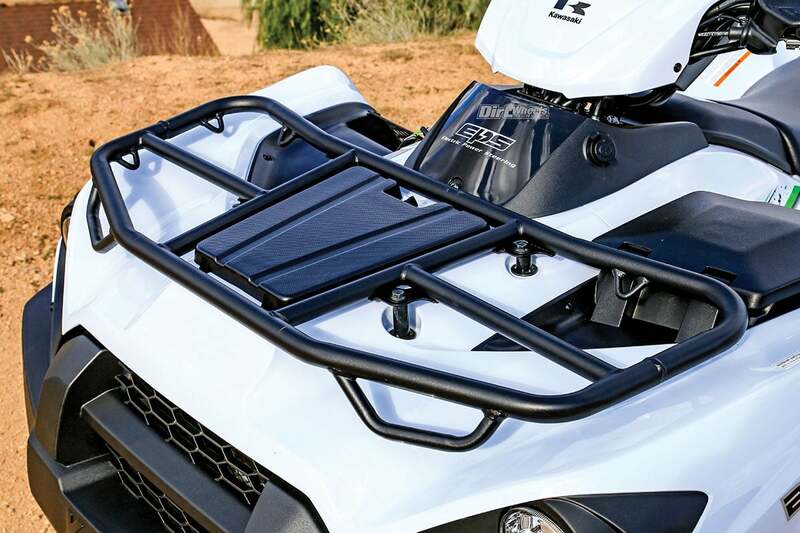 The Brute Force has multiple cargo containers and metal cargo racks on the front and rear. And last, we come to the Polaris Sportsman 570. This machine has the least torque feeling in the shootout, yet strangely feels more energetic than the Honda Rincon. It can tow the most at 1500 pounds and can hold more cargo than the rest of the group. The riding position and handlebar feel are also superior to its competition, if you leave the seat out of it. In fact, it was difficult to find issues with this machine. Yes, we would have preferred separate front and rear brake levers, but they aren’t needed. The 4×4 system doesn’t have a fully locking front differential, but the AWD system works very well and never hindered the quad in the rough stuff. The electronic power steering system was the strongest, and the steering felt the lightest and most controlled. Our favorite part about the Polaris, though, is the suspension. Suspension travel numbers are superior to the rest, and the ride is supple yet handles hard hits with ease. We would slap the winning seal of approval on this quad if it wasn’t for one issue we had out on the trails. The Polaris stopped starting. The starter relay went bad. The part is around $70 and it is two hours of labor. 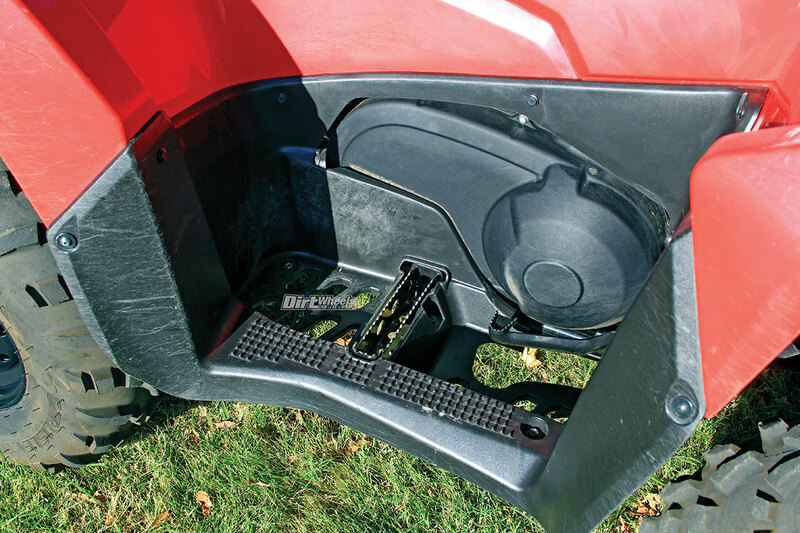 The KingQuad has a deep footwell with a standard footpeg. The foot brake is easy to reach, and this design was favored over the others. If you want a bulletproof machine, the Honda Rincon 680 is the way to go. You will have to pardon its strong need for upgrading and lack of features the others have. The Kawasaki Brute Force 750 4x4i EPS is a well-rounded machine with a powerful engine. Since the Polaris broke down, we would have to give the top honors to this rig. It is smooth, comfortable and fun to ride, and the enjoyment of giving it full throttle never gets old! Suzuki’s KingQuad 750AXi would have reigned supreme in this battle if they had designed the new model with a more stable steering platform. They did improve on the old model, but not quite enough. The cockpit and suspension are very good. We can’t shame the machine too much, because it still handles very well at comfortable speeds, but if you have the need to go fast, we say move onward to the Polaris. The Sportsman 570 needs more rpm to keep up with this group, but it handles the best in the group. The suspension soaks up chop and hard hits with ease, it has the best ground clearance, and the most confidence-inspiring cockpit. It also has the most capability in a working environment out of the four. There you have it; four great machines, all with some features that work better than their competition. Fuel capacity 4.4 gal 5.0 gal 4.5 gal 4.6 gal. Curb weight 657 lb 699 lb 730 lb 672 lb. Front 66 lb 88 lb 90 lb 66 lb. Rear 133 lb 176 lb 180 lb 132 lb. Towing N/A 1250 lb 1500 lb 1322 lb.